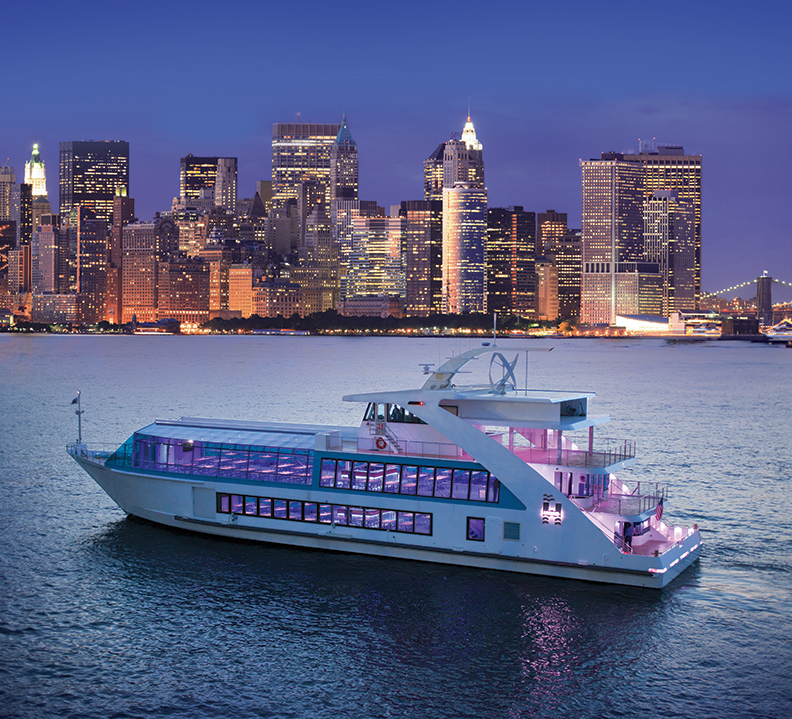 Hornblower Cruises & Events boasts the marine industry’s only hybrid passenger ferry fleet in North America. The first hybrid ferry was introduced to San Francisco Bay in 2009 by Alcatraz Cruises, a Hornblower Cruises & Events company, providing transportation to Alcatraz Island in accordance with their concession contract with the National Park Service. Since that time the remaining two primary vessels in the Alcatraz Cruises fleet have been hybridized, making Alcatraz Cruises the only passenger vessel company in North America with a fleet of hybrid vessels. In April 2012, Hornblower Cruises and Events christened another state-of-the-art hybrid vessel in New York Harbor, the Hornblower Hybrid. This newest hybrid sources power from the sun and wind, grid electricity as well as an on-board battery bank. Additionally the Hornblower Hybrid will derive power from hydrogen fuel cells, already installed on the Hornblower Hybrid, once that technology is approved by the US Coast Guard. The continuing development of marine industry hybridization, as well as hydrogen fuel cell technology, demonstrate Hornblower’s commitment to innovation, marine conservation, environmental stewardship and sustainability. For more detailed information on the New York Hornblower Hybrid vessel click on http://www.youtube.com/results?search_query=Hornblower+Hybrid+Technology. The Alcatraz Cruises Hybrid fleet uses power generated by ten‐foot‐tall wind turbines and photovoltaic solar arrays covering the awning on the top decks. That power is converted and stored in battery banks that then power the navigation tools, lighting and other electronics on board the vessels. Excess power is stored in the main propulsion battery banks. 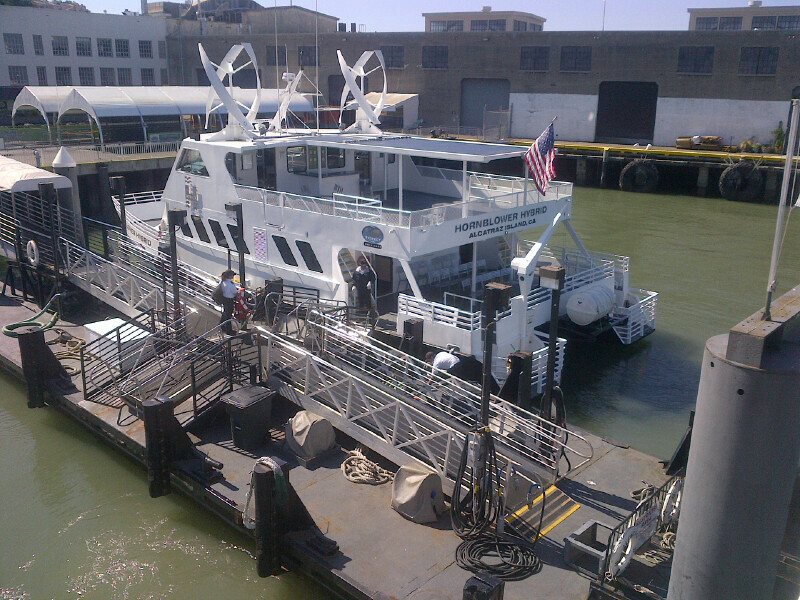 In San Francisco, the Alcatraz Cruises Hybrid fleet has redefined the profile of vessels on San Francisco Bay. As multipurpose vessels within the Alcatraz Cruises fleet, these boats ferry visitors to Alcatraz Island and Angel Island, as well as taking school groups and other passengers on cruises around the Bay. Alcatraz Cruises considered several different designs before selecting this particular system. Of greatest importance was the need to build a system that maximized the weather patterns on San Francisco Bay. This vessel system has been designed to be modified as technologies are improved or refined. www.alcatrazcruises.com or by calling 415‐981‐ROCK (7625).